All trips include transportation to the launch site, pick up from the landing and secure parking at our location. Advanced reservations are required: Book Your Trip Today! Group Rates are available for eight or more boats. Add a child ages 6 to 12 as a third person in your canoe for no additional charge. 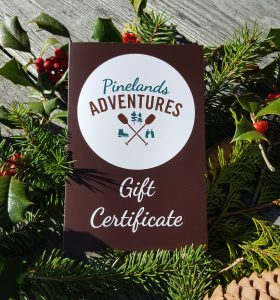 Current members of the Pinelands Preservation Alliance save 10% off of all regularly priced trips! Call 609-268-0189 for group rates of eight or more boats. Overnight paddlers must make a campsite reservation directly with Wharton State Forest for the Mullica River Wilderness Camp or Lower Forge Campsite on the Batsto River. Pricing for paddlers camping at the Mullica River Wilderness Camp. Pricing for paddlers camping at the Lower Forge Campsite on the Batsto River. 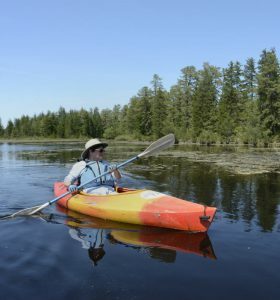 Rent a canoe or kayak for use at Atsion Cabins, Atsion Family Campsites, Atsion Recreation Area or Goshen Pond Campsites. Join Pinelands Preservation Alliance and a group of citizens committed to long-term protection of the New Jersey Pinelands. Stay in touch and learn about upcoming trips and adventures! © Pinelands Adventures. All Rights Reserved. Site by Fusionspark Media Inc.